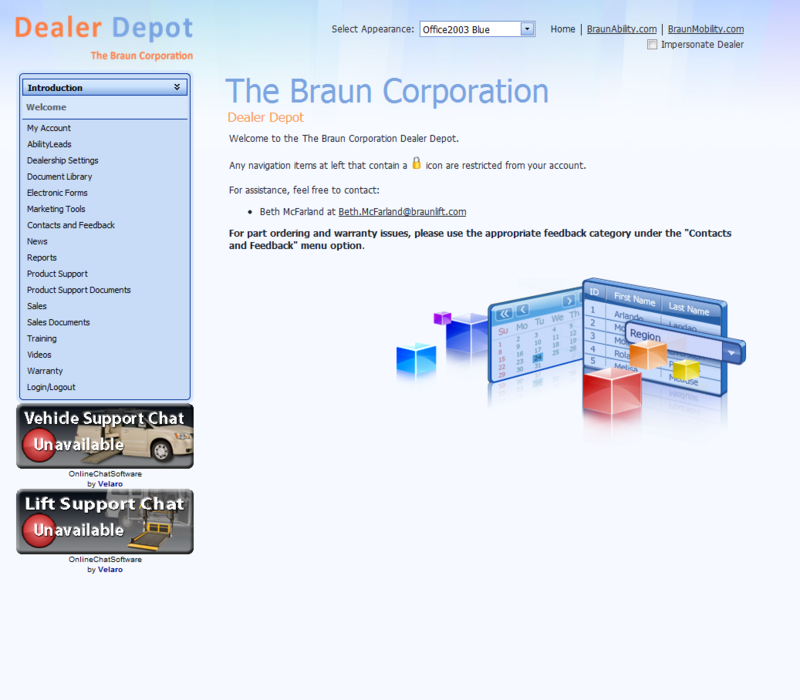 The Braun Corporation Dealer Depot website is an example of custom ASP.NET programming taken to the limit. While modern content management systems meet the needs of most website designs, some are so specialized that custom ASP.NET programming is the only solution. 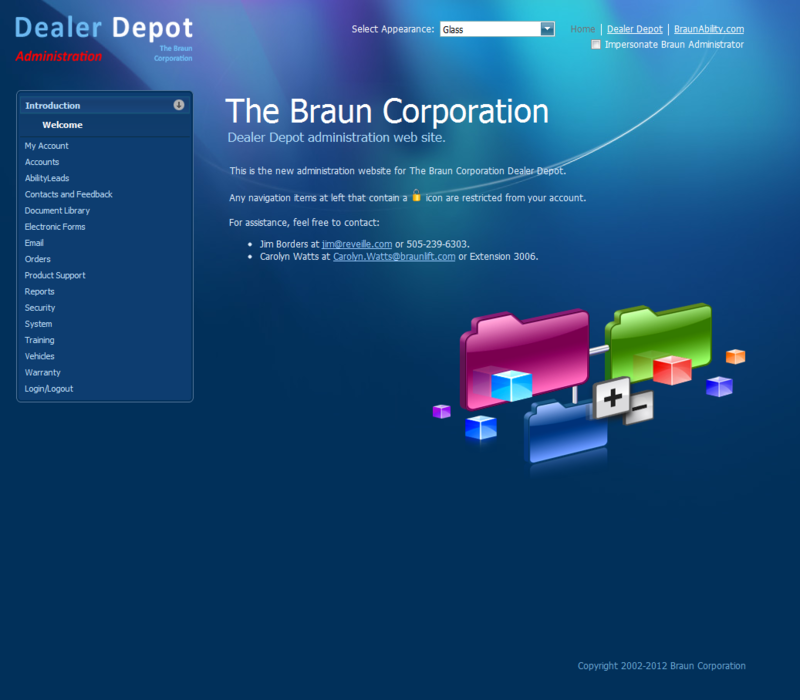 A comprehensive website developed for The Braun Corporation to interface with their 400 strong, worldwide dealer network. 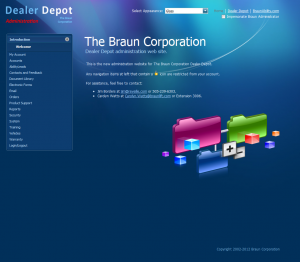 In addition to offering dealers more timely access to needed data, faster part ordering and warranty processing, this website has saved The Braun Corporation millions of dollars in labor savings alone. In addition to the dealer website, an administrative website was built for use by corporate personnel to configure all aspects of the dealer website. Access to each section of the website is controlled by an access control list maintained by the "super admin". Also, to verify and in some instances, troubleshoot access issues, the administration website gives the super admin the ability to impersonate another user. 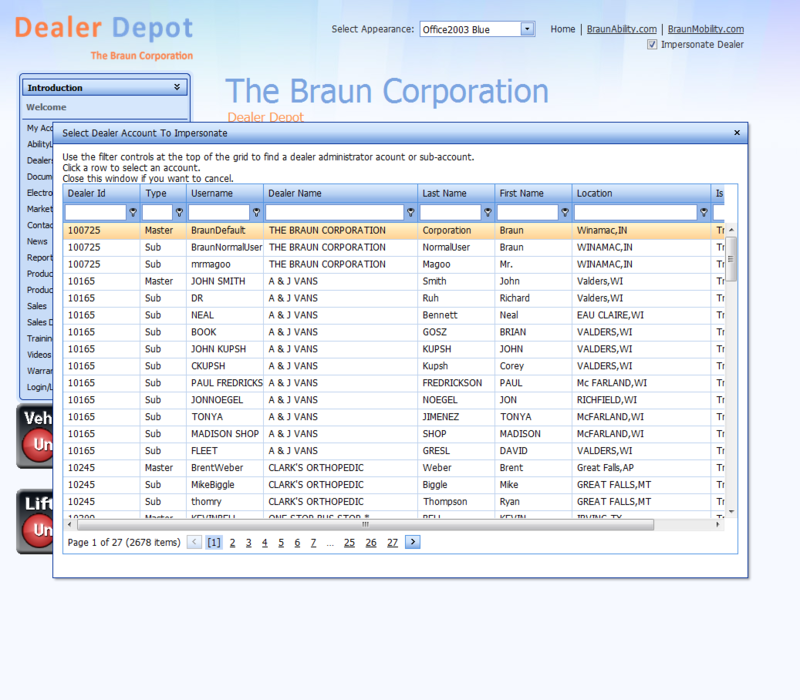 In Braun's environment, dealers are granted access to particular sections of the website, and in some instances certain filtered data, based on numerous access control lists. 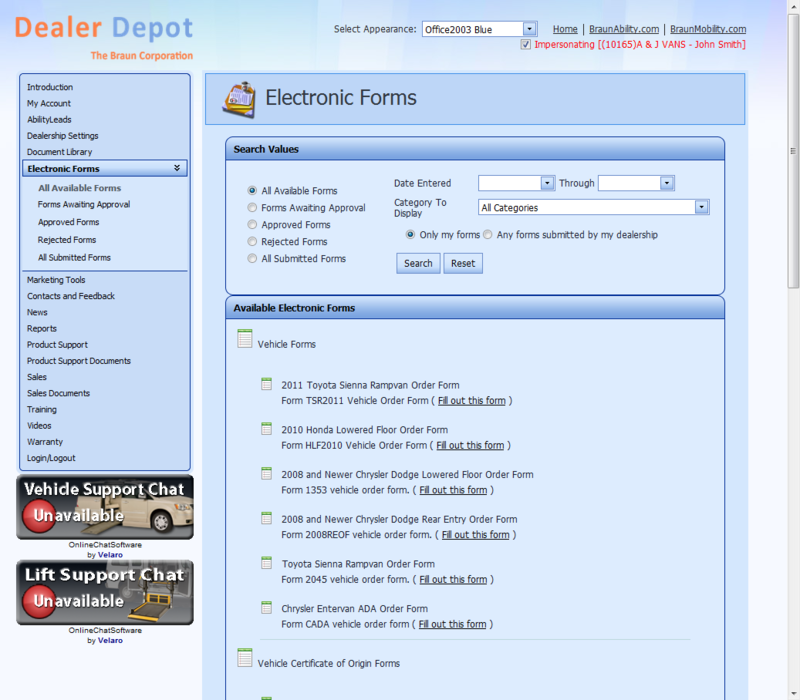 Master dealership accounts also have the capability to assign access controls to their own employees. 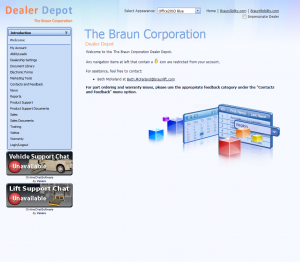 To troubleshoot access control issues that a user might be having, Braun administrative personnel have the ability to impersonate a particular dealer account and see exactly what the user would see when they are logged in to the website. This greatly reduces access control troubleshooting time, and allows Braun personnel to verify that a given user can only see what they should. To replace paper based forms, a secure and robust electronic forms system was developed based on Microsoft Office InfoPath. 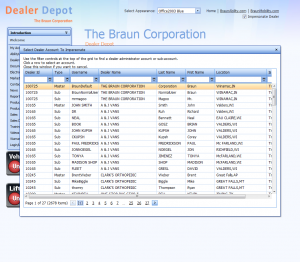 This allowed Braun personnel to create beautifully formatted and version controlled electronic smart forms that could be electronically shuttled back and forth between a dealer and the corporation. A workflow rules and validation engine was developed that ensured information submitted was correct, and routed the form to the correct departments upon successful completion and approval. Real-time, secure access to Braun's internal Oracle database is accomplished by using an intermediary server located between the web server and Braun's internal network. 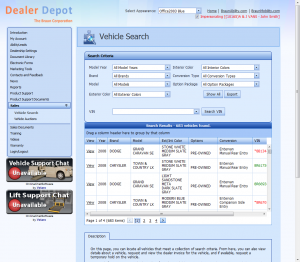 One of the most used instances of this real-time access is on the Vehicle Search page. 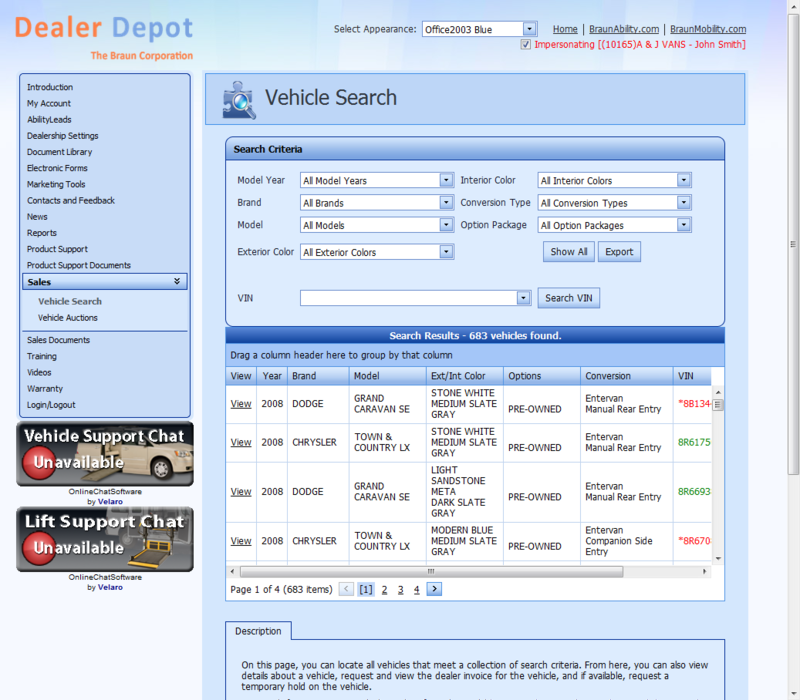 Using cutting edge AJAX technology, dealers can define search criteria with the smooth feel of a windows desktop application. Once a suitable vehicle is found, additional information such as invoice and photos can be obtained, and the vehicle can be put on hold while the appropriate electronic purchasing forms can be completed. Copyright © 1996 - 2019 Reveille Corporation. All Rights Reserved.